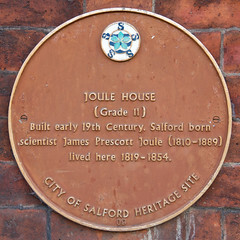 James Prescott Joule FRS (/dʒuːl/;(24 December 1818 – 11 October 1889) was an English physicist and brewer, born in Salford, Lancashire. Joule studied the nature of heat, and discovered its relationship to mechanical work (see energy). This led to the law of conservation of energy, which led to the development of the first law of thermodynamics. 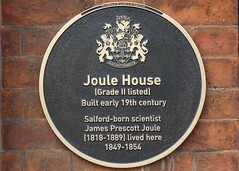 The SI derived unit of energy, the joule, is named after James Joule. 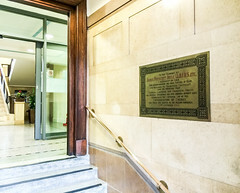 He worked with Lord Kelvin to develop the absolute scale of temperature the kelvin. Joule also made observations of magnetostriction, and he found the relationship between the current through a resistor and the heat dissipated, which is now called Joule's first law. 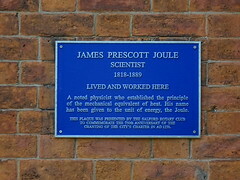 James Prescott Joule scientist 1818-1889 lived and worked here. A noted physicist who established the principle of the mechanical equivalent of heat. His name has been given to the unit of energy, the Joule. 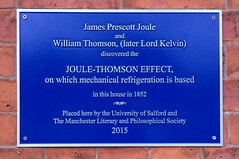 To the memory of James Prescott Joule LLD FRS, etc.. A resident of Sale, who demonstrated the true nature of heat, and measured its mechanical equivalent, and by proving that “chemical, electrical and mechanical forces are mutually convertible one into another without loss”. Established the universal law of the conservation of energy, this tablet was erected by his fellow-townsmen. 28th october 1905.